Thanks to our summer shenanigans, I’ve been kind of a slacker with the blog. One thing I’ve noticed in our gadding about is all the teenagers who have joined the workforce. It makes me remember my first summer job, waiting tables at Sylvia’s, a restaurant in Red Lodge, MT. I liked the work. Red Lodge is on the way to Yellowstone Park, and Sylvia’s was popular with both locals and tourists alike. Customers for the most part were in good spirits and eager to chat. I was schooled in so many ways. Instead of a uniform, we wore a khaki apron with the restaurant’s logo over our clothes. One day, I wore a sleeveless dress, and my co-worker informed me to never do that again, as “no one wants to gaze into your armpits when you’re setting down their food.” Excellent point. I also learned to drink coffee that summer. It feels almost blasphemous to admit, but I hated the taste at first. My shifts started at dark-thirty in the morning, and the freshly ground beans did smell fantastic. If you add enough cream and sugar, even dirty dishwater tastes good, and soon I was on my way to a life long addiction. I mean love affair. Sylvia’s was attached to a bar called the Carbon County Coal Company. At that time in Montana, you could serve alcohol even if you weren’t old enough to drink it. Since the bar was closed during weekdays, if a customer ordered a cocktail I’d have to whip that sucker up. It was a little eerie heading into the deserted bar, with its upturned chairs and stale cigarette smell. My imagination took over when I took hold of the bar gun that shoots different mixers, and I’d pretend I was in the movie “Cocktail.” That’s where the fantasy ended, though, because I was completely clueless when it came to mixing drinks. If someone ordered a Crown and coke, for example, I’d have to find Sylvia, who was also the cook. I’d ask, “Is Crown rum or vodka?” She’d roll her eyes and tell me it was whiskey. I also knew nothing about wine, other than it came in red, white, and pink. So when a customer asked what kind of wine we had, I’d die a little inside. I was too embarrassed to admit I didn’t know how to pronounce the house wines, so I just gave it my best shot. I’d say, “We have merLOT, (yes, I actually said “lot”), charDONnay, and white zinFANdel.” I wasn’t about to tell them we had cabernet sauvingon. Lord only knew how I’d butcher that one. I’m sure the customers thought Sylvia found me in the bottom of a haystack somewhere. After a month or so, I’d worked my way to the night shift, which was my favorite. The Coal Company had live music on weekends, often local favorite Billy Waldo and the Flying Grizzlies, and both the bar and restaurant would be hopping. It was all fun and games until someone ordered a bottle of wine. Sylvia tried to train me on the art of serving wine at a table. 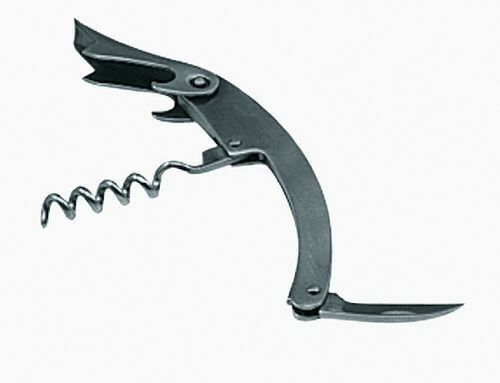 Using the tiny knife on the corkscrew, her hands deftly cut the foil off the top of the bottle. She made a little tent out of it and placed it on the table. Then she expertly removed the cork, placing it on the foil for the customer to examine. This took her all of five seconds. She’d done it a thousand times, and it must not have occurred to her that I might flop and flounder at the task that came so easily to her. I was so very bad at opening wine bottles, that when I approached a table I offered to get them a beer or a cocktail, hoping the power of suggestion would lead them to not order wine. Of course this didn’t work. At least then I could just hand over a wine list, so I wouldn’t have to make a stab a pronouncing Châteauneuf du Pape. I’d do okay with making the little foil tent. It was the cork that did me in. Sometimes I’d drill too far in and break it, which meant I had to do the walk of shame to fetch another bottle. Even worse were the times I couldn’t get the blasted cork out. I’d wrestle with that bottle, longing to stick it between my knees so I’d have more leverage. Inevitably, the man at the table would go all macho and ask if I needed some help. I’d smile over gritted teeth, shake my head, and try to retain some shred of dignity. I stayed in the restaurant biz throughout college. This included a VERY brief stint as a cocktail waitress, where I almost had my teeth rearranged because I used the single red tray from a pile of black trays. Apparently, this was a big no no. It was all about seniority, and the cocktail waitress who had earned the right to carry the red tray declared me her sworn enemy. It was a great reminder to stay the course and finish college. I was not cut out to be a cocktail waitress. Drunk people always seemed to run into me when I was carrying a tray brimming with beverages. My roommates plugged their noses when I came home, as I reeked of cigarette smoke. So I finagled my way into a hostessing position at one of the schwankiest places in Missoula at the time, the restaurant at The Holiday Inn. You may laugh, but it really was fine dining. White linen tablecloths, candles, servers in black tie, and I had to wear a dress and heels every shift. During one of my shifts, an unknowing server even delivered room service to Robert Redford, who answered the door wearing only a towel. As the rough edges were slowly pounded out of me, I learned about customer service. Like the time a very disgruntled customer approached the hostess station, banged both hands on the counter and yelled, “This is a G*# D*#* filthy establishment!” I probably would’ve shown him the door, but instead, I watched and learned as my boss expertly calmed him down. He actually came back the next night and had a lovely dinner. I learned about tolerance, too. A cross-dressing older gentleman, rumored to be Ernest Hemingway’s grandson, moved into the hotel one summer. Dr. Meriweather would show up for dinner in a nice suite, and ask if we’d seen his wife. Playing along, I’d shake my head and say I hadn’t. He’d go look for her, and about thirty minutes later, Mrs. Meriweather would appear in a killer dress and heels, looking remarkably like her husband. Mrs. Meriweather always preferred the corner table by the window. While she waited for her husband, she liked to sip on a Chardonnay. Which I could now pronounce, thank you very much. And I learned that just because someone is a Very Important Person, they can still have all the manners and finesse of a billy goat. A Montana senator who will remain nameless (but it rhymes with Bonrad Curns) came in for breakfast with several of his staff. When they finally left, no one had bothered to pay. On top of his dine and dash behavior, the senator had used his saucer as a spittoon. After recovering from the shock, I promptly called the front desk and charged his room for breakfast. And a generous tip, of course. Thanks to my brief career in the food service industry, I have mad cloth napkin folding skills and a big time weakness for those little Andes mints in the green wrapper. I tip well. I think the world would be a better place if everyone worked in a restaurant, at least once in their lives. And I’m very thankful for screw-top wine bottles. What was your first job, and what made it memorable? I’d love to hear from you! This entry was posted in Uncategorized and tagged Red Lodge MT, summer jobs, waiting tables, Wine by Beth Christopher. Bookmark the permalink. Beth, I continue to love reading your blog. It comes across my email while I’m at work and, while I try to save it for later, I can’t just leave it there. You are so funny. My very first job (when I was 15) was as a carhop at The Hotdog Palace. I actually wore roller skates and delivered food to the customer’s cars. We had 4 hot dog options: the Footlong Hot Dog, the Original Hot Dog, the Polish Dog and I can’t remember the name of the fourth. They could be ordered smothered in chili. I am still proud to say I never spilled food in a customers lap like my friend did :). It was a pretty fun job at the time. I would KILL to see you as a carhop on roller skates! At the Hotdog Palace, no less. I’m laughing out loud right now. Thanks for the comment! Ah! I love it!! I have waited many tables in my life and the lessons learned are priceless. Can’t count the number of times I had my behind touched (and my reaction was to punch back…) or was called “missy”. Also met so many wonderful people enjoying time together, and made good friends of other servers, trying to get through college, (or pay off student loans) like me! AND I never knew our house wines or spirits, I loved when folks ordered bottles of beer, easy! Here’s to great summer jobs! Amen to those beer orderers! Thanks for chiming in, Carol. Hope all is grand in Oz! Brilliant. You truly have a gift. Aw, thanks for your kind words, Mara. Beth, my parents bought a restaurant when I was 9 and so I worked in it for several years. At that age, I was a shoe in for serving coffee all around…oh the stories. I followed that with many more years in some kind of food service…I know, people gotta eat…so I figure it is always a good option if I need a job, bad. I shudder to think of my 9 year old serving coffee. Third degree burns all around! I was lucky enough to get to write at the local paper. I was only 16, but got to do the real thing, as local and small as it was. I could write books about what I learned, but many things are similar to what you learned: attention to detail, service to clients, politeness in service, and the special feeling of not being only oneself, but also a representative of something else. Lucky paper. Now you’re their claim to fame! I have good and bad memories of my summer job. I worked at a candy/nut store in the mall. I once won employee of the month because I sold almost $100 worth of chocolate covered cherries to a very drunk couple. Heh. Another great piece, which I expect to see in your memoir someday. My first indoor job was tossing pizza. We stood in front of a large window so people could watch. Our performance was always popular with the children; some nights the crowd of little ones would be three deep on the other side of the glass. A couple of years ago I became friends with a woman from Bailey, CO. One night she was recounting her childhood in Baltimore and she mentioned watching men throwing pizza through a window. After comparing ages and timelines we determined that she more than likely had been one of the little girls in my audience! This is SUCH a great post! You have totally reminded me what it felt like to have a job for the first time, and I agree about those stupid corkscrews. I STILL get bested by those bastards! My first job was at a huge tourist shop on Panama City Beach called Alvin’s Island Tropical Department Store. The exterior was built with concrete to look like a massive volcano, and we had live shark and alligator feedings several times a day. Inside, we sold–among other things–bathing suits, inappropriate t-shirts, postcards, sunglasses, shot glasses, fudge, taxidermy sharks and alligators, sailboats in a bottle, seashell wind chimes, beanie babies, embroidered t-shirts, and those dirty ballpoint pens where the lady’s dress comes off when you pick the pen up. What an experience THAT was!! Ha! I think I’ve been there! You probably tried to hijack the shark and alligator and set them free, right? First job was making banana splits at an ice cream “parlour” when I was 16. Best job I ever had. Nothing since has matched the pure decadence and love that went into selecting a ripe yet unblemished banana, scooping out perfectly round balls of vanilla, strawberry and chocolate ice cream, drizzling the strawberry and fudge syrup, sprinking the crushed pineapple, then nestling an artifically-red cherry in a cloud of whipped cream. Ended up eating as much as I prepared, but it sure beats being a lawyer! Sounds like a delicious job! I’d eat all the profits, for sure. Thanks for the comment!